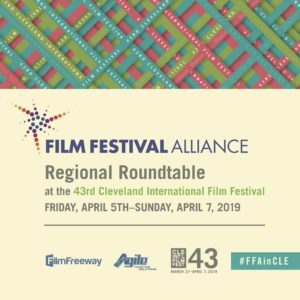 FFA presents its first Regional Roundtable of 2019, taking place Friday, April 5th – Sunday, April 7th at the 43rd Cleveland International Film Festival. The overall theme for this gathering is Communication & Connectivity – with an emphasis on marketing, media, community engagement/ partnerships, branding, and publicity. Register here. Learn more about the weekend – including a group field trip to the Rock & Roll Hall of Fame – and CIFF, here. CIFF43 program details will be available at clevelandfilm.org on Friday, March 1. Attendance has exceeded 100,000 for the past four years. Complimentary industry passes will be offered to the first 30 FFA members who register. Discounted Industry Passes will be available for non-members. All festival professionals are welcome to attend. Thank you to our sponsors Agile Ticketing Solutions and FilmFreeway. The NEA is back at work and has announced upcoming grant opportunities and deadlines for film festivals and organizations. Proposals are accepted across 15 disciplines for the Art Works award, including Media Arts. During this upcoming deadline, the Media Arts discipline accepts proposals for projects that support exhibition, presentation, distribution, and preservation activities for all genres and forms of media art that uses electronic media, film, and/or technology. A general guidelines webinar for the 2019 Art Works program is now available here. If you have been a Challenge America applicant in the past and are interested in applying to the Art Works program, a special webinar is available here. Note: It is recommended to submit the SF-424 form to Grants.gov by 02/05/19. The Challenge America category offers support primarily to small and mid-sized organizations for projects that extend the reach of the arts to underserved populations — those whose opportunities to experience the arts are limited by geography, ethnicity, economics, or disability. Grants are available for professional arts programming and for projects that emphasize the potential of the arts in community development. Note: It is recommended to register/renew your Grants.gov/SAM registration by 03/20/19 and submit the SF-424 form to Grants.gov by 04/02/19.